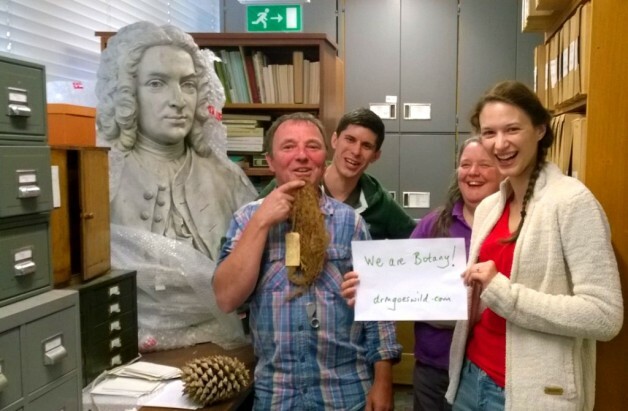 Home eXtreme botany Botany trending on Twitter: #iamabotanist! At last Twitter is alive with the sound of botany! Or at least the dulcet tones of a podcast from Dr Chris Martine of Bucknell University in the USA and a host of hashtags proclaiming #iamabotanist and #reclaimthename. You may recall Chris Martine as the brains and the humour behind the “Plants are cool too” videos. 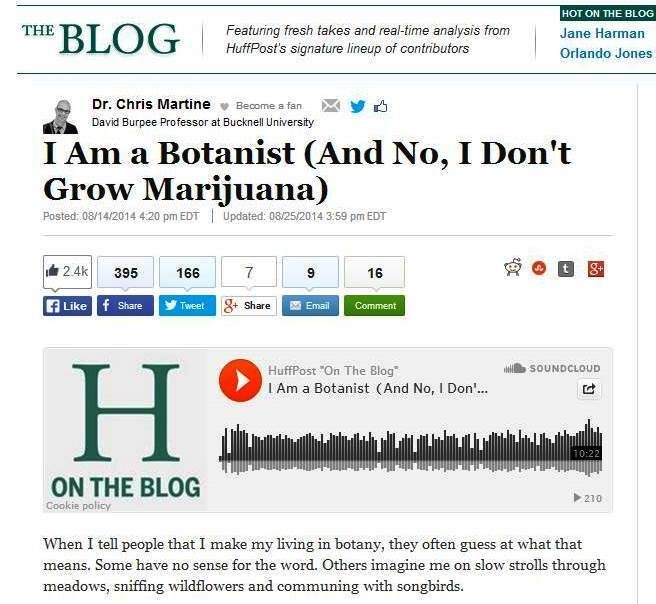 Well, Chris Martine is just as keen to show the Twitter world and the real world that there’s more to botany than going all googly-eyed over pretty flowers or going all googly-brained over growing marijuana (well, that’s what botanists do isn’t it?). 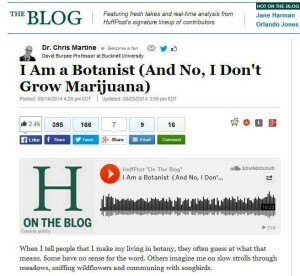 In a blog post in the HuffPost Science entitled: “I Am a Botanist (And No, I Don’t Grow Marijuana)“, Chris Martine explains that plants allow humans to get food, breathe oxygen and get high on a diversity of intoxicating plant derivatives! Unfortunately for the professional botanists, perhaps the latter has begun to overshadow the former. Chris Martine goes on to explain why botany is a fascinating and serious science and why it’s time for a rebrand. Well it’s not exactly a rebrand, the name botany is spot on, the hashtag #reclaimtheneame says it all: don’t lose the name “botany” it’s what we are what we do! But the word “botany” as a university degree title, a research area and a profession has slowly but surely been replaced by the term “plant science“. Dr M has been on this topic for ages, and in his post “botany is dead long live eXtreme botany“, has already lamented the tendency to ban the term botany from University curricula, research discussion and debate, and to replace it with the worthy but anodyne “plant science”. But the term “plant science” is just too bland, it does not excite, it does not inspire, it does not cut the mustard! (Brassicaceae: mustard includes several genera and a number of different species). It’s time to make a stand: we are BOTANY, we are BOTANISTS! Plants are just the most beautiful, fascinating and important members of the biosphere and we need to study, love and treasure them now and for future generations. So whether you consider yourself a botanist or not, join the eXtreme botanical fun and join the eXtreme botanical mission and get tweeting! Take a selfie of yourself, family, friends, colleagues even strangers, pose with your favourite plants and display a notice proudly proclaiming #iamabotanist!